When I was purchasing the "will run for cupcakes" and the pumpkin dot bondi bands, I decided to order a few extras to sell. 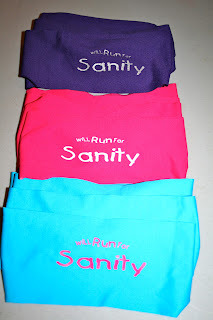 They have a "will run for sanity" bondi that I thought was perfect! I bought a few extras and want to give you the opportunity to purchase one for a donation to LLS. I've got three different colors, four of each. These are first come, first serve. If there is enough interest, I can order more, but I wanted to see how these would go first! They will be $8 each, and I will pay for shipping. If you are interested, please send an email to run.in.sanity@gmail.com with your color selection. I will invoice you through paypal (or we can work out other payment options if you prefer!). Thank you!